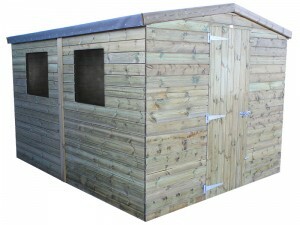 Garden sheds are a great way of improving the appearance and practicality of any garden. 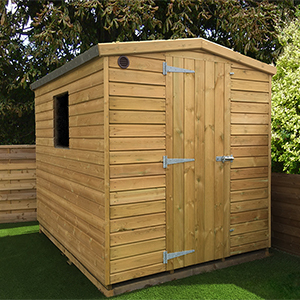 Our highest quality Challenger shed range is manufactured from Scandinavian Redwood and is 100% pressure treated to protect it against wood decay and insect attack for up to 25 years. 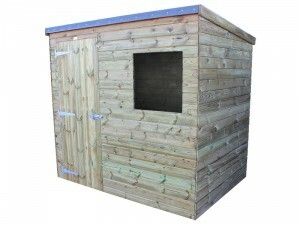 All of the range is constructed using rounded 45mm x 35mm framework for extra strength, clad with 15mm shiplap and have a roof AND floor machined from 25mm tongue & groove timber. Add to this heavy duty mineral roof felt with a 7+ year life expectancy and The Challenger shed offers a much more robust and better quality option than cheaper alternatives and will give many more years of reliable service. We recommend siting the shed on treated timber bearers with a thin strip of roof felt to act as a Damp Proof Course or ideally a well draining concrete base to avoid standing water. 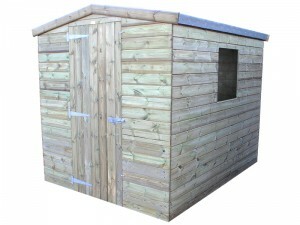 Each shed comes flat packed with full self assembly instructions and a comprehensive fitting kit. 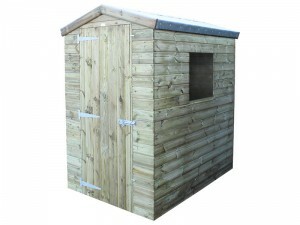 This product is delivery only, usually next day within our delivery areas – more information. Ask our counter staff about our recommended base construction and assembly contractors. DIY with everything you need to complete the project from Challenge Fencing shown when you add a Challenger garden shed to your basket.